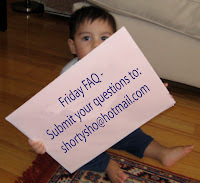 I want my Nanny: Friday FAQ - Where are you? Since I don't have a question to answer, and I didn't blog yesterday, I thought I'd add a post-script to a topic I mentioned this week. I've been worried, ever since our Dear A won 20,000 Air Miles, about having to deal with additional vacation requests. (Click here for the background) Well, a request came, but not from Dear A. Her best friend D, a former nanny I really really like, has permanently returned home to get married, settle down etc. D emailed me this week asking if I would allow Dear A to return to the Philippines in May to serve as Maid of Honour. She went as far as to mention that my acquiescence would be a wedding present to her. I said yes. I'm a sucker for wedding-related stuff. I'm a MOH myself this year, for my best friend. And, frankly, I was impressed with the amazing guilt factor employed! Not sure how its all going to work out yet, will keep you posted.